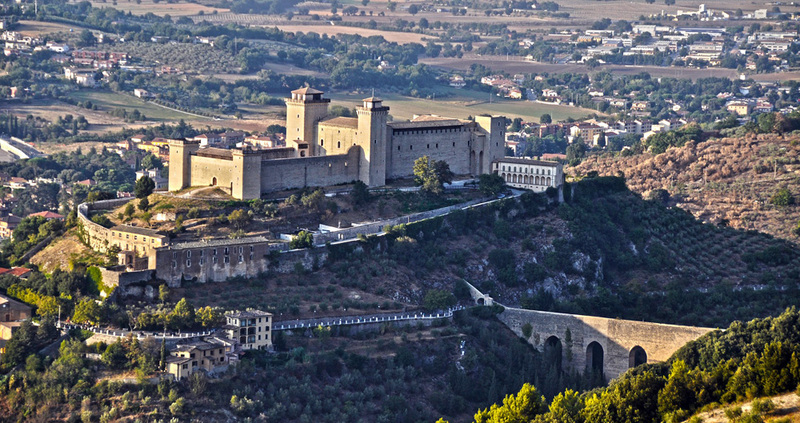 Spoleto, while also showing evident influences from the Roman era in the urban fabric, maintains an ancient medieval aspect that remains substantially intact due to the period in which it was first flourishing as a Longobard Duchy, and then as an important center of the Papal State. The most ancient origins of Spoleto belong to the arch of Druso of 23 d.C. (near the Romanesque church of Sant’Ansano) and the Roman Theater, whose construction dates back to the early years of the Roman Empire, and also the early fourth century Christian basilica of the of San Salvatore (about 1.2 km north). Not far from the thirteenth-century church of S. Gregorio Maggiore, which is characterized by its striking apse and the raised presbytery, there is still a Roman bridge with three arches made from blocks of travertine (also called Sanguinario) and the amphitheater from the second century. A.D.
Monuments of a more recent period but equally fascinating are the churches of San Domenico and San Ponziano, both built around the 12th century. The Basilica di San Pietro is also certainly of great interest due to the extraordinary bas-reliefs that adorn its thirteenth-century façade. 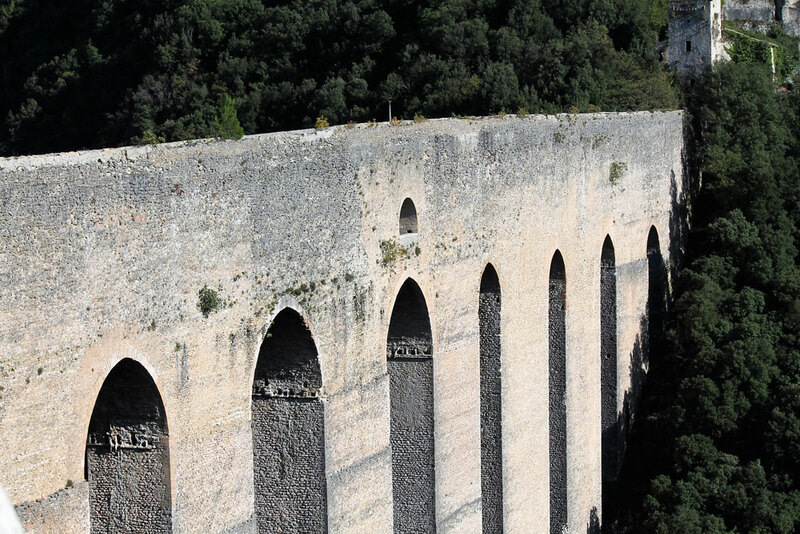 From the front of San Pietro you can enjoy a spectacular panorama that embraces all of Spoleto up to the mighty Ponte delle Torri with its ten arches standing 80 meters high and 230 meters long situated on the slopes of the mountain that dominates the town. The bridge connects the Rocca, in which construction was started in 1352 on the orders of Cardinal Egidio Albornotz and was designed by Matteo Gattaponi. Monteluco was the sacred mountain to the anchorites, who settled here starting from the 7th century founding the convent of San Francesco (about 8km from the town) and the church of San Giuliano. 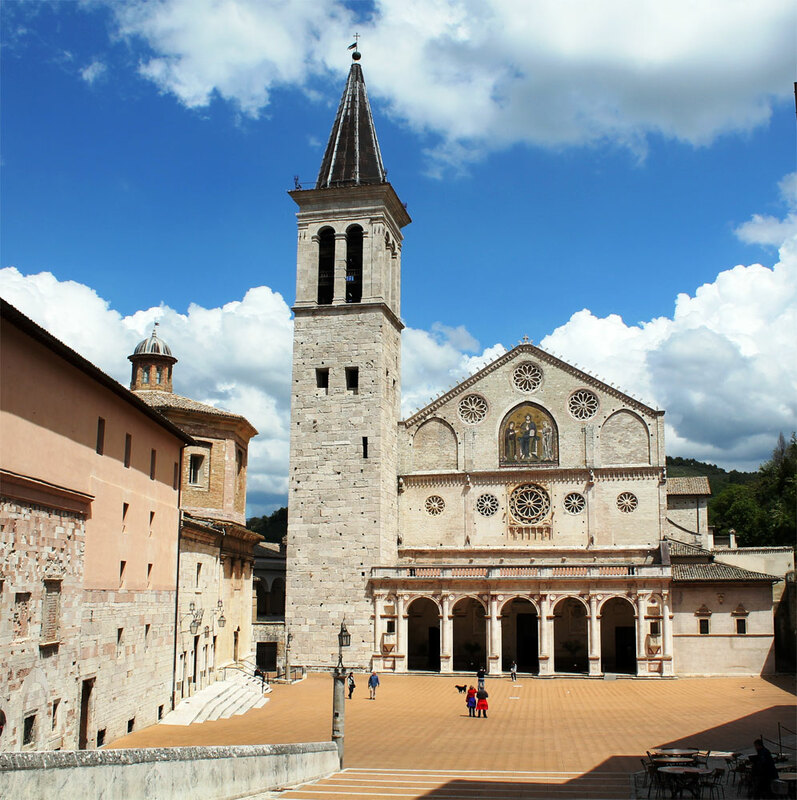 An unforgettable site for those lucky enough to visit the area would be the Cathedral of Spoleto. Built in the twelfth century and characterized by the richness of its interior furnishings, the byzantine mosaics of its façade and the Romanesque Church of Sant’Eufemia, the cathedral is a spectacle not to be missed. Among the most important events organized annually in the city is the Festival dei Due Mondi (the festival of the two worlds) a summer celebration of music, art and culture. Spoleto is located in an unspoiled territory in the heart of the green Umbrian countryside. Outdoor activities, pure air, a luxuriant flora, abundant wildlife and enchanting landscapes altogether make Spoleto an ideal place to spend a peaceful holiday enjoying nature. Spoleto and its territory have important gastronomic and wine traditions, capable of offering intense culinary experiences. A genuine cuisine based on fresh products with healthy and refined recipes.